Centro de Investigaciones en Ecosistemas, Universidad Nacional Autónoma de México, Apartado postal 273, 58089 Morelia, Michoacán, México. The Centro Ecológico de Sonora is a natural protected area where the natural vegetation remained undisturbed at least until 1997. Since then, Cenchrus ciliaris has become a prominent element of the vegetation because of disturbance. Climate, soil properties, population structure and biological activity for C. ciliaris were studied to gain understanding of the ecological mechanisms that favored the invasion by this exotic grass. Mean air temperature and annual rainfall were 24.8°C and 302 mm. The soil was a loamysand that was poor in most nutrients, but particularly rich in phosphorus. Pennisetum ciliare was the most abundant species at the Centro Ecológico, representing over one third of total plant ground cover. Basal area for individual plants ranged from less than 1 cm2 to almost 1 m2. Living leaves per plant increased with precipitation, peaking at 199 leaves in March 2005, and no living leaves were found after 103 days without rain. The environmental conditions prevalent at Centro Ecológico are very favorable for C. ciliaris, whose establishment was apparently triggered by a major disturbance caused by the development of housing projects. Key words: El Niño Southern Oscillation (ENSO), forage production, global change, Cenchrus ciliare, urban sprawl. El Centro Ecológico de Sonora es un área natural protegida donde la vegetación autóctona permaneció sin disturbios por lo menos hasta 1997. Desde entonces, Cenchrus ciliaris se ha convertido en un elemento prominente de la vegetación. Se estudiaron el clima, las propiedades del suelo, la estructura de la población y la actividad biológica de C. ciliaris, como una aproximación al entendimiento de los mecanismos ecológicos que favorecieron la invasión por este pasto exótico. La temperatura media del aire y la precipitación anual fueron de 24.8 °C y 302 mm. El suelo fue una arena limosa pobre en minerales, pero particularmente rica en fósforo. Cenchrus ciliaris fue la especie herbácea más abundante en el Centro Ecológico, representando más de un tercio de la cobertura vegetal. El área basal de plantas de esta especie osciló desde menos de 1 cm2 hasta casi 1 m2. El número de hojas vivas por planta aumentó con la precipitación, con un máximo de 199 hojas en Marzo de 2005, y no se encontraron hojas vivas después de 103 días sin lluvia. Las condiciones ambientales del Centro Ecológico son muy favorables para C. ciliaris, cuyo establecimiento en este sitio aparentemente fue inducido por un disturbio causado por la construcción de vivienda. Palabras clave: El Niño  Oscilación del Sur (ENSO), producción de forraje, cambio global, Cenchrus ciliare, expansión urbana. The African bunch grass Cenchrus ciliaris L. (syn. Pennisetum ciliare (L.) Link; common name buffel grass) was introduced to the state of Sonora, where cattle raising is an important economic activity, during the mid20th Century (SaucedoMonarque et al., 1997; IbarraFlores et al., 2004; Instituto Nacional de Geografía, Estadística e Informática, 2005). New artificial prairies or pastures are continuously being established with C. ciliaris, but the contribution of their combined areas to cattle ranching has remained relatively stable, at least during the past 10 years, representing about 4% of the 1 500 000 ha devoted to cattle pastures in Sonora (Instituto Nacional de Geografía, Estadística e Informática, 2005). Despite apparent stability of the area cultivated with C. ciliaris, the area of Sonora that is actually covered by this grass has been increasing exponentially and it could extend to over half of the state's surface (CastellanosV. et al., 2002; Arriaga et al., 2004). The continuous establishment of C. ciliaris pastures is due to plant dieout rather than to an increase in the state's economic activity (IbarraF. et al., 1995; Instituto Nacional de Geografía, Estadística e Informática, 2005). Cenchrus ciliaris is "escaping" very successfully to new sites, especially in the vicinity of disturbed areas (D'Antonio and Vitousek, 1992; Williams and Baruch, 2000; CastellanosV. et al., 2002; McIvor, 2003). The Centro Ecológico de Sonora is a nature preserve located near the southern limit of Hermosillo, the state capital of Sonora. With almost 3 quarters of a million inhabitants, urban growth exerts increasing pressure on surrounding lands (Instituto Nacional de Geografía, Estadística e Informática, 2005). The original vegetation of the Centro Ecológico did not include C. ciliaris before 1997 (MolinaFreaner and TinocoOjanguren, 1997). Contrasting is its present condition, where C. ciliaris is a very prominent component of the vegetation. With the aim of documenting present conditions at the Centro Ecológico de Sonora, this study characterized plant cover at the reserve, with a special consideration of the invasive grass C. ciliaris, and related its presence with the prevailing environmental conditions, seeking insight regarding mechanisms leading to the success of this invader of the southern Sonoran Desert. The Centro Ecológico de Sonora (29° 01' N; 110° 57' W; 245 m in elevation) is a 188 ha nature preserve established in 1984 by the state legislature. Its native flora comprises approximately 300 species of vascular plants and its vegetation belongs to the Plains of Sonora vegetational subdivision (Shreve and Wiggings, 1964; MolinaFreaner and TinocoOjanguren, 1997). Air temperature and precipitation records from 1961 to 1990 were extracted from the ERIC II climate database (Instituto Mexicano de Tecnología del Agua, Cuernavaca, Morelos, Mexico) for the closest weather station, No. 26139 (29° 6' N latitude; 110° 58' W longitude; 211 m in elevation). Only the 18 years with complete records were utilized for climate analysis. Daily rainfall data from January 2004 to June 2005 were provided by Servicio Meteorológico Nacional. On 24 March 2004, the vegetation cover was characterized for the plains and hill slopes from Centro Ecológico. In particular, 2 m × 2 m quadrats were observed every 15 m along transects that were laid on the plains or on northfacing hill slopes (n = 50 quadrats per transect). For each quadrat, ground cover was assessed as percentage for the most notorious species in the herbaceous stratum. Soil samples were collected twice along each transect. The top 2 cm layer was discarded, and a soil column of approximately 15 cm in depth was well mixed and collected. After being ovendried to constant weight, the soil samples were submitted to Laboratorio de Alta Tecnología de Orizaba (Orizaba, Veracruz) for determination of texture and mineral composition. The population structure for randomly selected individuals of Cenchrus ciliaris was characterized on 24 March 2004 and on 18 February 2005. In particular, basal area (calculated assuming a circular geometry for plants with the average of 2 perpendicular basal diameters) and height were determined for each individual. 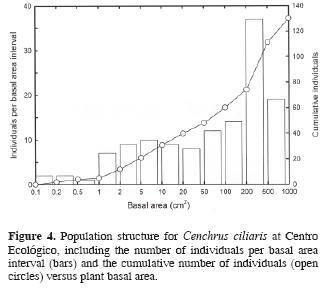 The number of living leaves was counted on several occasions between January 2004 and June 2005 for 10 C. ciliaris individuals whose basal areas and heights respectively averaged 437 ± 25 cm2 and 84 ± 2 cm. Statistical analyses were performed with Sigma Stat 3.5 (Systat Software, Point Richmond, California, U.S.A.). Data were compared using an ANOVA followed by Tukey tests except for pairwise soil data, which were compared with Student's t tests. Results are presented as mean ± 1 S.E. Mean air temperature at Centro Ecológico was 24.8 °C, with the lowest temperature of 16.6 °C occurring in January and the highest temperature of 32.6 °C occurring in July (Fig. 1). The lowest monthly low temperature of 5.8 °C was registered in January 1977 and the highest monthly high temperature of 40.6 °C was registered in June and July 1970 (Data not shown). 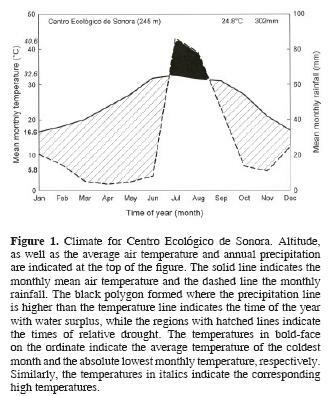 The mean annual precipitation at Centro Ecológico de Sonora was 302 ± 20 mm with approximately 70% of the rainfall occurring during the summer, followed by a 9monthlong period of relative drought (Fig. 1). The driest year was 1972 with a precipitation of only 186 mm and the wettest year was 1984 with a precipitation that reached 512 mm. Total rainfall during 2004 amounted to 296 mm (Fig. 2A), which occurred in 2 periods separated by a 70day long drought. Rainfall between 1 January and 27 April represented 22% of that year's rainfall, and rainfall that occurred between 7 July and 30 December contributed with most of the rain for 2004 (Fig. 2A). During the first half of 2005, the accumulated precipitation at Centro Ecológico totaled 124 mm. Most of the rainfall for this period occurred between 3 January and 13 February, while 20% occurred in late May, after a 103daylong drought (Fig. 2A). The number of living leaves per individual increased with rainfall (Fig. 2A, B). In particular, the number of living leaves per plant was 75 ± 18 after the winter rains of 2004, decreasing by 75% after 70 days of drought in July 2004 (Fig. 2B). 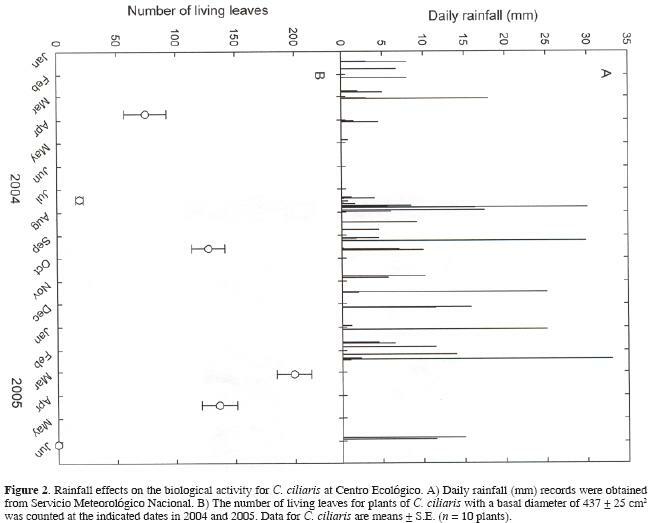 The number of living leaves increased during the 8 months of essentially uninterrupted rain, peaking at 199 ± 15 leaves per plant on 4 March 2005 (Fig. 2B). The following months of drought resulted in a decrease of the number of living leaves until none were observed in June 2005 (Fig. 2B). Soil properties at Centro Ecológico were essentially the same on the plains as on the hill slopes so data are presented together (Table 1). The only significant difference was found for the total nitrogen content (p < 0.05 from a ttest), being 33% lower on the slopes than on the plains. 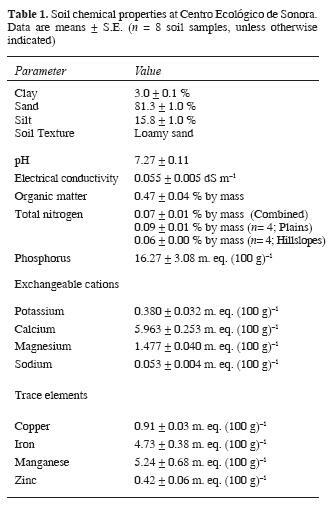 Soil texture was a loamy sand, which had a neutral pH and an electrical conductivity of 0.06 ± 0.01 dS m1 (Table 1). Organic matter content averaged 0.47 ± 0.04% by mass and phosphorous averaged 16.3 ± 3 mg kg1 (Table 1). Exchangeable cations ranged from 0.053 ± 0.004 m. eq. (100 g)1 for sodium to 5.963 ± 0.253 m. eq. (100 g)1 for calcium (Table 1). Trace elements ranged from 0.42 ± 0.06 m. eq. (100 g)1 for zinc to 5.24 ± 0.68 m. eq. (100 g)1 for manganese (Table 1). Plant cover on the plains averaged 72 ± 3% (Fig. 3). The dominant species were the invasive grass Cenchrus ciliaris, with 22 ± 4%, the native shrub, Encelia farinosa Gray, with 28 ± 4%, and native grasses, mainly Bouteloua gracilis (Kunth) Lag. ex Griffiths, with 21 ± 2% (Fig. 3). On the hill slopes, total plant cover was 47 ± 3% (Fig. 3), significantly lower than on the plains (p < 0.0001; from a oneway ANOVA). The contribution of C. ciliaris to plant cover of the hill slopes was 31 ± 4%. It did not vary significantly from its contribution to plant cover on the plains (p = 0.083 from a Tukey test). In contrast, the contributions of E. farinosa and B. gracilis to total plant cover on the hill slopes were respectively 87.5 % (p < 0.001) and 48.7 % (p = 0.003) lower at the slopes than on the plains. For both topographies, winter annuals represented a minor component of the vegetation cover, averaging 0.5 ± 0.2%. The population structure was obtained by pooling together the 30 plants measured in 2004 with the 100 individuals from 2005 (Fig. 4). Plant basal area ranged from 0.13 cm2 to 971 cm2. An average of 1.7 individuals was found for each 1 of the 3 basal area intervals smaller than 1 cm2. The frequency of plants per interval tended to increase for plants with a basal area of up to 10 cm2. A slight decrease in frequency for the plants with a basal area between 20 cm2 and 50 cm2 was observed. For the larger basal area intervals, frequency increased until a mode was reached for those individuals with a basal area between 200 cm2 and 500 cm2, representing 28.5% of the sampled plants. The largest basal area interval, which did not exceed 1 000 cm2, contained only about 15% of the total sample. The relatively warm winters and moderate rainfall regime prevalent at the Centro Ecológico de Sonora were strikingly similar to those reported for places in Kenya where Cenchrus ciliaris is native; even more than at other sites within the Sonoran Desert where pastures have persisted and even extended spontaneously (Cox et al., 1988; IbarraF. et al., 1995). Indeed, climate has major effects on the distribution of plant species. Various studies support this observation at different resolutions, including the generation of statistical and computational models for broad scale predictions of areas vulnerable to invasion by C. ciliaris (Arriaga et al., 2004), the direct comparison of climates and plant productivities for specific buffel prairies at a local scale (IbarraF. et al., 1995), and even models that consider the physiological performance for individuals under particular microenvironmental conditions (Nobel et al., 2002; De la Barrera and Andrade, 2005; De la Barrera and Castellanos, 2007). Each environmental factor has distinct effects. For instance, low temperature extremes appear to be the main reason for exclusion of C. ciliaris from a given area, although young plants are sensitive to high temperatures, while average air temperatures are determinant for plant productivity (Cox et al., 1988; MartínR. et al., 1995; Stair et al., 1998; Nobel et al., 2002; De la Barrera and Castellanos, 2007). Water availability is perhaps the main environmental factor that limits plant productivity in deserts (Búrquez et al. 1999; Larcher 2002; Nobel 2005). In this respect, the shallow roots of C. ciliaris can take advantage of light rainfalls (MartinR. et al., 1995; Neto et al., 2000; Williams and Baruch, 2000). Indeed, a characteristic that has made C. ciliaris a valuable forage crop is its sensitivity to water, i.e., a rainfall of 20 mm suffices to trigger resprouting of dormant plants within 2 weeks (MartínR. et al., 1995). However, no living leaves were found for C. ciliaris at 25 d after a combined rainfall of 27 mm in late spring 2005. This can be attributed to the very low hydraulic conductivity of dry soil (Young and Nobel, 1986; Nobel, 2005). Indeed, most of the lateMay 2005 precipitation, which occurred after over 100 days of drought, was probably lost by evaporation and superficial runoff. In contrast, an even distribution of rainfall, resulting in better water infiltration, probably helped C. ciliaris to remain green throughout 2004. In this respect, the differences in rainfall observed between 2004 and 2005 can be attributed to an El Niño event that occurred between June 2004 and March 2005 (National Weather Service, 2006). Soil characteristics also have major effects on the ecological performance of a species. In particular, C. ciliaris tends to dieout in soils with a sand content below 40% and is generally excluded from soils with less than 30% sand, and more than 50% clay and 60% silt (Cox et al., 1988; IbarraF. et al., 1995; Arriaga et al., 2004). The coarse soil texture found at the Centro Ecológico presumably permitted good aeration and offered low resistance against root growth for C. ciliaris. Moreover, disturbance of the soil, such as that following the development of a housing project and the opening of dirtroads for wildfire management, probably enhanced the mechanical properties of the soil at this location (Nie et al., 1997; Williams and Baruch, 2000; McIvor, 2003). Similar effects result from certain plowing practices used to enhance the productivity of C. ciliaris in old fields (Ibarra Flores, 2004; Blanco et al., 2005). The levels of soil nitrogen (and of most minerals) at the Centro Ecológico were considerably low, even lower than at places in its native Kenya where C. ciliaris had originally been collected (IbarraF. et al., 1995). Apparently, the longterm ecological success of C. ciliaris decreases at higher levels of soil nitrogen (IbarraF. et al., 1995). The mechanisms behind such a reduction of survival at higher soil nitrogen levels needs further investigation, especially when considering that this species responds positively to increasing concentrations of applied nitrogen (Medeiros et al., 1998). Moreover, the grass abundantly grows under the endemic nitrogenfixing legume trees Cercidium microphyllum (Torr.) Rose et Johnson and Olneya tesota Gray (which respectively have approximate frequencies of 0.075 and 0.080 m2 at Centro Ecologico; unpublished observations). Phosphorus was the nutrient whose levels were particularly higher at Centro Ecológico compared with other places of the Sonoran Desert where C. ciliaris persists or spreads, but similar to those from Kenya (IbarraF. et al., 1995). Such an improvement in the productivity of C. ciliaris in response to soil phosphorous levels has been confirmed experimentally for this and several other grasses (McIvor, 1984). Before the invasion by C. ciliaris, the vegetation at Centro Ecológico was a mature plant community typical of the Sonoran Desert (MolinaFreaner and TinocoOjanguren, 1997). Considering that C. ciliaris has been cultivated and spreading in Sonora for nearly 50 years (SaucedoMonarque et al., 1997; Ibarra Flores et al., 2004), perhaps a pertinent question would rather ask why this species invaded Centro Ecológico only very recently. Indeed, its seedlings are weak competitors that can only thrive under very particular environmental conditions (McIvor, 2003; De la Barrera and Castellanos, 2007). But, once the colonization by C. ciliaris is underway, dramatic changes in vegetation occur. In this respect, reports from the literature are not consistent. Some document a loss of biodiversity following the establishment of C. ciliaris (SaucedoMonarque et al., 1997; Lyons et al., in press), while others do not find significant effects of this invasive species (Blanco et al., 2005). Moreover, when herbivores are excluded, the grass seems to act as a nurse plant for seedlings of O. tesota (K.G. Lyons, personal communication). Here, C. ciliaris has become very abundant at the Centro Ecológico, but it does not seem to have displaced E. farinosa, which essentially displayed the same ground cover as the invasive grass on the plains. Ironically, this native Asteraceae is considered noxious by cattle ranchers because it 'invades' C. ciliaris pastures, spearheading the regeneration of native plant communities (Martín Rivera 1989; Castellanos et al., 2005). In general, plant cover on the hill slopes, where Cenchrus ciliaris is the predominant species, was less dense than on the plains. These facts probably contribute to the local perception that the species performs better on hill slopes than on flat lands. At least in the present study, however, where percent ground cover by C. ciliaris was similar on either topography, this seems to be a mere optical illusion. Given that removal of plant material does not occur for C. ciliaris at the Centro Ecológico and that dry matter accumulates after each growth season, plant size can be used as an indicator of plant age, and the population structure reflects the dynamics of the invasion at Centro Ecológico. In particular, even when the grass reached the reserve in the past, it failed to establish until a land clearing for a major housing development took place. The largest plants found in this study could thus indicate the time for the onset of the invasion. For the next few growing seasons, the grass most likely aggressively spread leading to the currently observed predominance of plants with a basal area of 200 to 500 cm2. Alternatively, though, the most frequent size interval for C. ciliaris individuals could merely be an indicator of the maximum size achievable by this species under the prevailing environmental conditions. Defoliation stimulates growth for C. ciliaris, so the lack of biomass removal could effectively be inhibiting further growth (BeltranLópez et al., 2002). Moreover, limits to plant size may be imposed by the continuous decomposition of dead plant material accumulated after each growth cycle, a process that is favored by rain (MartínR. et al., 1995). The environmental characteristics of the Centro Ecológico de Sonora were very favorable for the establishment of C. ciliaris, which invaded the reserve very recently, following disturbance caused by urban growth. Stemming from this study, several questions can be posed regarding the mechanisms that allow the vigorous expansion of areas with C. ciliaris in northwestern Mexico. At the same time, questions regarding pasture management arise. For instance, if land clearing acts as a soil treatment that favors the establishment of C. ciliaris, it should not be used as a rehabilitation practice in the the way it is used for the control of fountain grass (Pennisetum setaceum [Forssk.] Chiov) in Hawaii (Cabin et al., 2002). From the rangeland point of view, some plowing practices could potentially invigorate pastures that have lost productivity. Also, if external disturbances favor the invasion by exotic species into natural protected areas, such as C. ciliaris to the Centro Ecológico, perhaps better management practices for buffer zones would need to be developed for preventing the establishment of such invasives, which are difficult to eradicate later on (Cabin et al., 2002; McIvor, 2003). The already difficult task of conservation biologists managing natural protected areas has added complexities in Mexico, where peoples often make meager livelihoods in areas of ecological interest. In other cases, as for extensive cattle ranching based on C. ciliaris pastures in Sonora, the economic interests against conservation are strong. In addition, most of such protected areas are already disturbed (Bazzazz et al., 1998). A compromise between conservation and economy is desirable, i.e., some conservation is better than none. Actually, many of such disturbed places allow the conservation of native biotas when they create habitat heterogeneity (Lambrinos, 2000; RiojasLópez and Mellink, 2005). And the collection of native ornamental and useful plants in rural backyards has already proven to be a valuable way to preserve biodiversity (PimientaBarrios, 1994). An understanding of the specific mechanisms that favor the establishment of C. ciliaris in the Sonoran Desert will help the conservation of this biodiverse desert biome in various ways. First, areas vulnerable to invasion will be clearly identified allowing for their protection; second, effective weed control practices could be developed, and third, the establishment of pastures at sites where the grass is not viable will be avoided, sparing native habitat. Servicio Meteorológico Nacional kindly provided recent climatological data. Useful discussions with Drs. Enrico Yepez, Alejandro Castellanos, and José Luis Andrade, as well as field assistance by Mr. Romeo Méndez, are gratefuly acknowledged. Research was conducted at Universidad de Sonora and the manuscript was prepared at Centro de Investigación Científica de Yucatán, while the author held a generous UCMEXUS Postdoctoral Research Fellowship.